Bananas, Bananas and More Bananas! I try to keep bananas on hand to use in place of sugar when blending a natural drink. My present favorite drink contains papaya, red hibiscus blossoms, fresh mint, maracuya (passion fruit) and the optional banana. Since red and green make brown, the mint makes the concoction a bit ugly – but hey! – dim the lights and enjoy the flavor while your body drinks in nutrients! I often forget to strain the drinks before serving my friends, and they stare at me with this, “You really don’t expect me to drink this….. do you?” kind of look! Have you ever wondered what bananas look like when you find them in the wild? 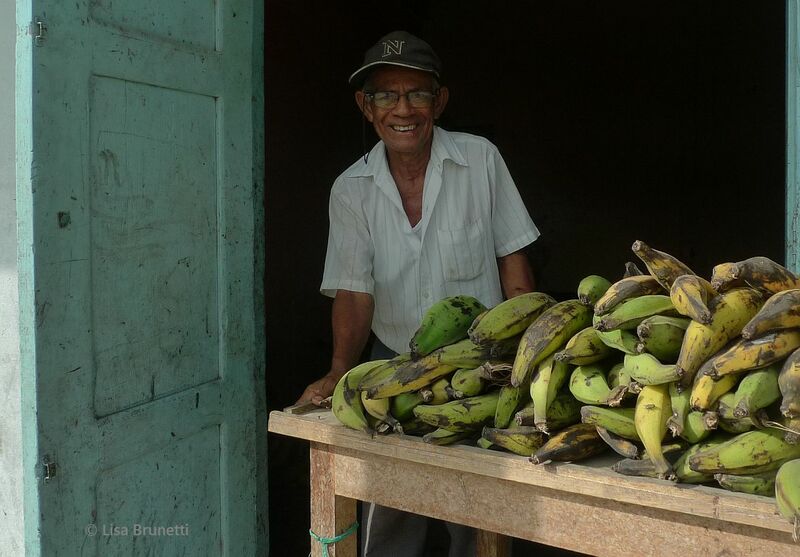 Enjoy a trek with Kris and Joel in Panama’s northern region and see some bananas that don’t quite look like the ones you buy at the supermarket!Read it HERE: Let’s Go Hunt For Bananas! John and Mary McDonald in San Clemente, Ecuador showered me with an ‘all you can eat’ bananafest (as well as an amazing Sunday feast!) Read how they happened upon a surplus of bananas HERE: Yes, We Have Bananas!